It remains to be seen what will be full impact of any Mexico policy shift under the new US administration. However, given Donald Trump´s announcements of a radical change in his Mexico policy during the campaign, exchange rate volatility increased over the last couple of months, with a Mexican peso depreciation by more than 10%. Exchange rate volatility is expected to continue over the coming weeks, until the US policy towards Mexico under president-elect Trump becomes clearer. While the exchange rate acts as a shock absorber for the Mexican economy, the peso depreciation has pushed up inflation. As a consequence, the Bank of Mexico has increased the benchmark interest rate several times since the beginning of 2016 – from a record low of 3% at the end of 2015 to 4.75% in October 2016, and in the short-term additional interest rate hikes to more than 5% are expected. However, this monetary policy negatively impacts domestic demand in times of an already sluggish GDP growth rate of just about 2% in 2016 (mainly due to decreased oil prices, lower oil production, tighter fiscal policies and low productivity growth). 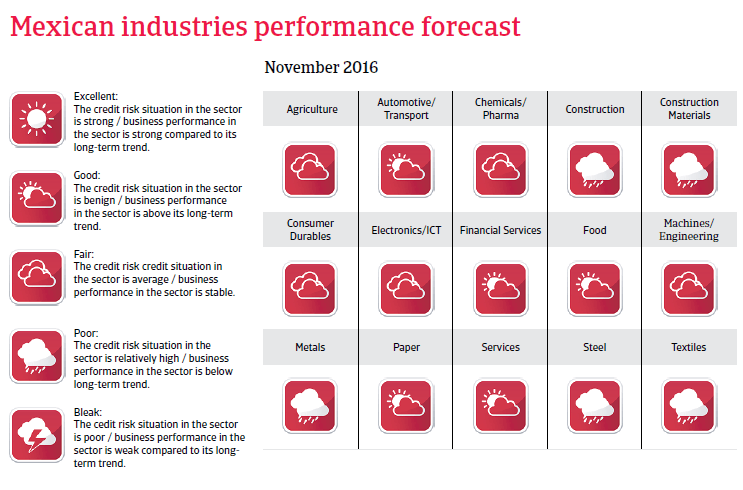 At the same time on-going domestic political woes (the still unstable security situation caused by drug-related crime incidents and widespread corruption) continue to affect business and consumer confidence. 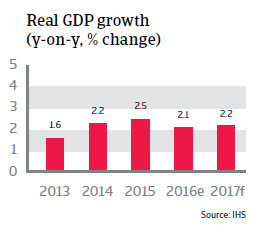 The projected Mexican GDP growth rate of about 2% in 2017 and 2018 could end up much lower if Donald Trump puts into practice some of the announcements he made during the campaign period, e.g. renegotiate NAFTA or even withdraw from it, imposing import tariffs on Mexican goods, impose capital controls over remittances (which account for 2.5% of Mexican GDP) and order mass deportations of illegal immigrants. Increased economic insecurity could also hamper foreign direct investment in Mexico, especially in the oil sector (international tenders for deep water oil fields). The peso depreciation mainly affects companies that depend on imported goods and/or are indebted in US dollar. Cash flow is affected if higher producer prices cannot be passed on to customers. Some businesses have already started to delay payments, waiting for the peso to strengthen again. Rising interest rates could adversely affect businesses that are already financially stretched, limiting their ability to repay interest and capital and/or renew their bank lines, which could lead to breach of covenants and default. Any import taxes imposed by the US on trade with Mexican businesses would severely hurt exporters and those in the value chain that sell their goods to exporting companies. 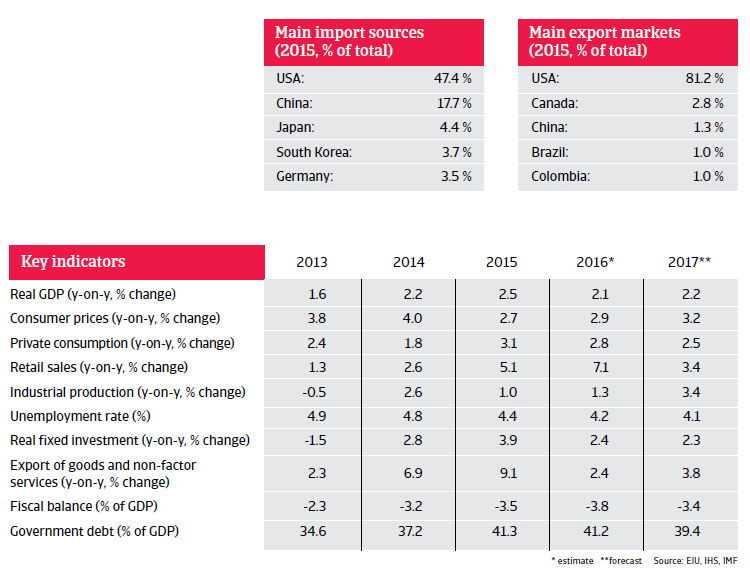 The main affected Mexican sectors would be car manufacturing, electronics, machinery, and oil. Concerns about government finances have increased, due to growing public debt (56% of GDP in 2016 compared to 50% of GDP in 2014) and rising spending pressures, which are related to major problems at the state-owned and heavily leveraged oil company Pemex. In 2015 and early 2016 Pemex’s net losses doubled, while arrears to providers have mounted and liquidity has decreased. Subsequent government support for Pemex weighs on sovereign creditworthiness. Despite major cost-cutting plans and debt restructuring, it cannot be ruled out that the company could require additional support on top of the already provided capital injections, reduced tax tariffs and credit lines from state-owned banks. That said, Mexico´s fiscal framework has improved and tax revenues have increased, following a tax reform passed in 2013. The share of oil in government revenues declined from more than 30% to 20%. Given the persistently low oil prices, fiscal consolidation measures have been implemented. Moreover, Mexico’s resilience is underpinned by a flexible exchange rate and solid external balances, with limited external refinancing needs. 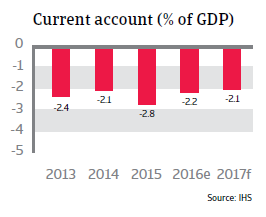 While the current account deficit increased to 2.8% of GDP in 2015 due to low oil prices, it is expected to decrease again in 2016 and 2017, in line with gradually recovering energy prices. There is additional liquidity potential from a precautionary IMF credit line of USD 70 billion on which Mexico can draw in times of adverse global credit conditions. The solvency situation is also robust, with foreign debt ratios under control. Since 2013 the Peña Nieto administration and the Mexican Congress have passed some comprehensive reforms to overcome the economy´s structural weaknesses: low earnings capacity, limited fiscal flexibility and high dependency on volatile portfolio capital inflows. With oil production decreasing over the last ten years and the government´s high dependence on oil revenues, the centrepiece of the reform efforts has been the reorganisation of the energy sector. Pemex, the state-owned oil and gas company, lacks the know-how and financial resources to invest in exploration and production, mainly because it pays 90% of its revenues to the state. Pemex therefore urgently needed permission to cooperate with private (foreign) investors for joint exploration, refining and distribution. Constitutional changes implemented at the end of 2014 have put an end to Pemex’s 75-year monopoly and have enabled foreign companies to invest in the exploitation of offshore oil fields and shale gas. In the face of still low oil prices, the government has so far adopted a pragmatic approach in its auctions to sell oil exploration rights to foreign companies, e.g. by adjusting contract terms to make them more friendly to investors. 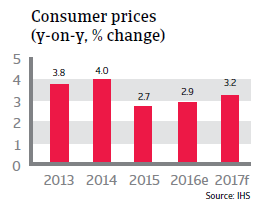 Other reforms (liberalisation of the telecommunications and the labour market, a reform of the tax system to broaden the tax base and to open the monopolised electricity sector) have made slow, but steady progress so far. A comprehensive implementation of the reforms would increase investment and significantly improve the economy´s productivity and competitiveness, raising Mexico´s potential annual GDP growth rate from around 3.0% to 4%-5% in the long term. However, public protests and political struggles between the main parties could still derail proper implementation. More needs to be done to tackle the poor domestic security linked to drug-related violence and rampant corruption, which severely affect the business climate and hamper economic performance by discouraging investors. At the same time, the profitability of many businesses has suffered from threats and violence against business owners, including the kidnapping of their family members. For a solid recovery of the country’s medium-term earnings capacity, Mexico would need to improve its law enforcement, the independence of the judiciary system and to overhaul police institutions.